A Need For Success: Who is Izayaki? With the postseason now in full swing, one story that has escaped the communities excitement has been the Los Angeles Valiant’s secondary flex support player, Kim "Izayaki" Min-Chul. Between his origins playing competitively in South Korea to tangentially being apart of the inaugural season of the Overwatch League, Izayaki has a certain mystique about him that is endearing. After probing into his backstory a bit more, Izayaki -- or rather Need -- has quite the interesting tale. Whether it was unlucky matchups or unfortunate draws in opponents, Izayaki’s early days were middling on paper, but in reality, his team’s consistency could speak to his strength and why he’s outlasted other flex supports. Our first glimpse of Need was during the Davich Overwatch Amateur League where he played for team Vmax. Unfortunately for Need, he was paired against the team who would win the entire event and took an early exit in the quarterfinals. Need would stay with the Vmax brand for a good portion of his time in South Korea. Shortly after the conclusion of the Davich Overwatch Amateur League in July, Vmax would pass through the qualifications for the Season 1 of Open Division Korea as the seed from Group G. However, fate did not smile fondly on Need as they drew Bucheon NPlus, the team who would ultimately finish second, in the first round of the playoffs. Vmax and Need again would take an early exit at 5-8th place. This would not stop Need from attempting to show his skills under the biggest tent in town. During the APEX Season 4 online qualifiers, Vmax advanced into the group stage out of Group #3. However, they drew Element Mystic in their group and only could manage the second seed. Undeterred, Vmax played through an additional wildcard group under and finished as the second seed directly under NC Wolves. The offline qualifiers faired a bit better for the hopefuls. Vmax advanced out of Group A as the first seed over teams like Element Mystic and NC Wolves. The second phase of group play would drudge up their consistency issues again. Vmax went winless in Group E and their only chance and making APEX Challengers rested on a single best of three for the 7th seed and the only wildcard slot. Their opponents, Blaze, arguably had a stronger group and even managed to take a best of three off of Lunatic-Hai’s sister team. However, Vmax would have other plans for Blaze as they defeated them 2-1 for the wildcard slot for APEX Challengers Season 5. Need had finally gained some ground on making it to the main event of OGN’s APEX Overwatch League, but first he had to compete against some of South Korea’s best players sat in the second division, APEX Challengers. Sadly, Vmax was not up to the test and bowed out of the first group stage with only two wins under their belt. However, Need could find some consolation knowing that his team managed to take maps of off nearly every team, but this would be his final event with Vmax as he departed for a new team. The Nexus Cup 2017 Annual Finals would be where we next saw Need with team Foxes. Advancing into the playoffs as the second seed out of Group B with a 2-1 record, Need and Foxes just narrowly missed capturing the first seed, this placed them directly into the losers’ bracket. After a 2-1 win over Miracle Team One, Foxes would take suffer an early exit out of the event at the hands of Meta Athena. Like any event, takeaways are important lessons to be learned, but the next event would put Need at the helm of the South Korean Overwatch division. While OGN’s APEX was now dissolved, Overwatch Contenders Korea took its place. Need and the Foxes would fair much better in the inaugural season, placing third in the group be under the likes of RunAway and Seven. However, leading into the playoffs Need would fall victim to a reoccurring theme throughout his history. Foxes drew X6-Gaming, the eventual winners, as their first-round opponent, and placed 5-8th. Again, Need would suffer a cruel and unusual fate, but coaches and analysts are always watching. 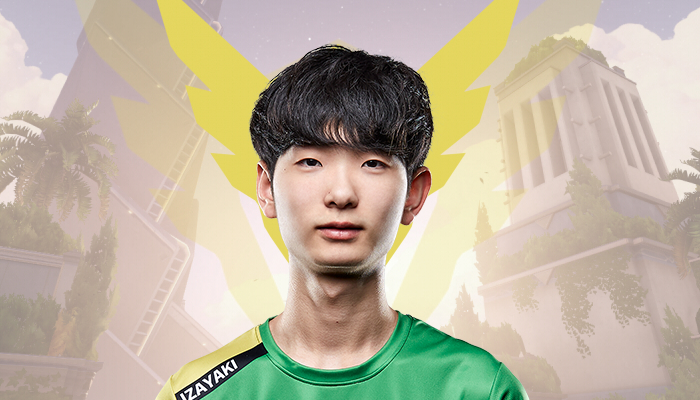 Need joined the Los Angeles Valiant early into Stage 3 and changed his handle to “Izayaki”, but sadly, he never saw any time on the stage. Having to sit out for any length of time is horrible for the career of a progamer. Izayaki was signed to the team in April of 2018. We now are approaching the end of the year and he hasn’t seen any competitive environment since Overwatch Contenders Season 1. And you may be quick to jump at the fact that he’s still in a team and is still practicing with them; these two things are mutually exclusive to one another. Being a member of the Los Angeles Valiant starting roster and going on stage to play in front of hundreds of people is very different from practicing in an environment that is completely controlled at a team practice facility. To add to his mystique, a coach from his former team, Park "Crusty" Da-hee, has a successful track record in scouting very good flex support players. For example, Choi "Bdosin" Seung-Tae from London Spitfire, Park "Neko" Se-Hyeon and Kwon "AimGod" Min-Seok from Boston Uprising all have played under Crusty at some point or another. To add to that record, there is an unofficial report that ties Park "Viol2t" Min-Ki from the Overwatch Contenders Korea team O2 Ardeont with Crusty at San Fransisco Shock. While the evidence is loose, there is something to be said that Izayaki never technically played under Crusty. He was coached by the rest of the support staff under the Foxes banner, whom easily could have adopted some of Crusty’s criteria for scouting. Again, this is more speculative but could be used as a supportive claim for why the Valiant would keep someone who has very little experience on the main stage aboard for the second season. It is seldom that you see a team who, for one reason or another, does not field a player hold onto them for very long. The Los Angeles Valiant must put a lot of faith in him to invest in him since the later end of season one. As for my take? I can’t wait to see what he has in store. His experience within an Overwatch League team environment without the pressure of playing is a double-edged sword. For one, he’s gotten a chance to see what it takes to play in a grueling league format with two matches a week. While this is changing, one can still argue that the amount of preparation doesn’t necessarily have to change. However, this gives teams more freedom to control how they spend their time. And two, Izayaki has proven that he is a strong flex support and is willing to work. I don’t think you spend that much time in what is basically Korea’s tier three scene without having a solid work ethic. Combine that with his team’s relative success compared to some of their peers and I think you’ve got the makings of an amazing player. While the preseason has been quiet for some, the Los Angeles Valiant are co-hosting an event alongside the San Fransisco Shock. On October 20th the California Cup will pit the two Overwatch League franchises against one another. Hopefully, we’ll get to see Izayaki and have him showcase why he was kept on board before the start of the Overwatch League’s second season. _____ Joseph “Volamel” Franco has followed esports since the MLGs of 2006. He started out primarily following Starcraft 2, Halo 3, and Super Smash Bros. Melee. He has transitioned from viewer to journalist and writes freelance primarily about Overwatch and League of Legends. If you would like to know more or follow his thoughts on esports you can follow him at @Volamel. Images courtesy of Blizzard Entertainment.